ABSTRACT: We demonstrate, by using mathematical modeling of cell division cycle (CDC) dynamics, a potential mechanism for precisely controlling the frequency of cell division and regulating the size of a dividing cell. Control of the cell cycle is achieved by artificially expressing a protein that reversibly binds and inactivates any one of the CDC proteins. In the simplest case, such as the checkpoint-free situation encountered in early amphibian embryos, the frequency of CDC oscillations can be increased or decreased by regulating the rate of synthesis, the binding rate, or the equilibrium constant of the binding protein. In a more complex model of cell division, where size-control checkpoints are included, we show that the same reversible binding reaction can alter the mean cell mass in a continuously dividing cell. Because this control scheme is general and requires only the expression of a single protein, it provides a practical means for tuning the characteristics of the cell cycle in vivo. 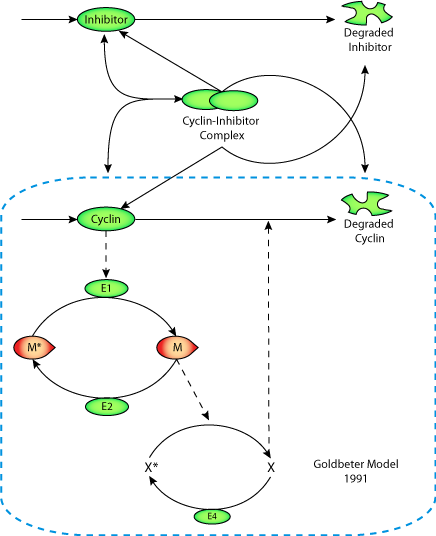 Control of the Goldbeter 1991 model with a cyclin inhibitor. M represents cdc2 kinase, X represents the fraction of active (phosphorylated) cyclin protease, and * represents the fraction of inactive enzymes. The Goldbeter model is outlined by the dashed box. Solid arrows indicate protein synthesis, degradation or enzymatic conversion. Dashed arrows represent activation. Derived from workspace Gardner, Dolnik, Collins, 1998 at changeset 1c73a9f1a4f8.